‘Giallo’ (pronounced “jahlo”), literally translated from Italian, means “yellow”. The term came to prominence in the late 1920s when Italy’s Mondadori publishing house started issuing murder mystery novels with yellow covers, originally by British and American writers such as Agatha Christie, Raymond Chandler, Ellery Queen and Ed McBain. 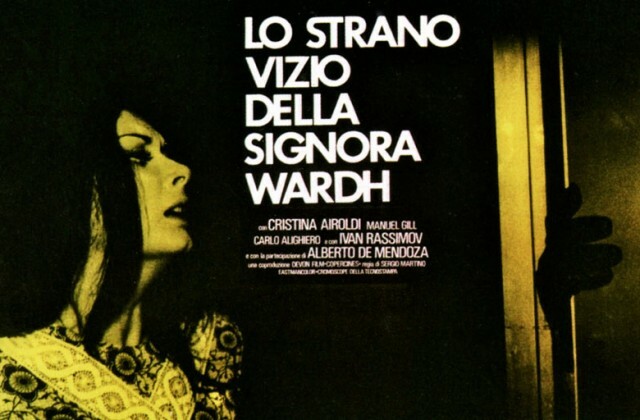 Once the giallo made the transition from the printed page to the screen in the mid 1960s, beginning with Mario Bava’s The Girl Who Knew Too Much (AKA The Evil Eye) in 1963, an important distinction began to emerge, notably that extended murder setpieces became the artistic centre of the films, often accompanied by bizarre investigatory practices, melodramatic acting and overpowering musical scores. This course looks at the peak period of the Italian giallo film (1963 – 1982) and discusses the historical development of the genre as well as its predominant themes and motifs, placing it contextually within the changing landscape of Italian and European popular cinema. Issues covered include misogyny, paranoia, xenophobia, the sexual revolution, alcoholism and self-medication, and the giallo’s fantasy microcosm of leisure and independent wealth. Key giallo figures whose work will be discussed include Mario Bava, Dario Argento, Sergio Martino, Luciano Ercoli, Umberto Lenzi, Lucio Fulci, Massimo Dallamano, Ernesto Gastaldi and others. The course will also look at the giallo’s influence on contemporary cinema (most notably the films of Bruno Forzani and Helene Cattet), pop culture, and the curious legacy of J&B Whiskey.